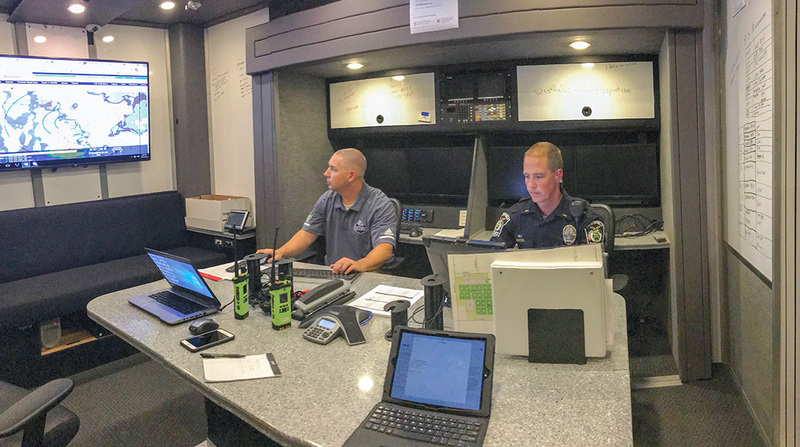 The City of Westfield acquired the Mobile Command Center from Hamilton County in April, and Colts Training Camp is the first occasion the city has activated the MCC. The MCC is stationed at Grand Park for the duration of Colts Camp. It coordinates security, safety and logistics, monitors emergency radio and online traffic and site activity and communicates directly with the National Weather Service and can dispatch fire, police and other resources as needed. The command center is permanently housed at the Westfield Public Safety building but has the ability to be mobilized. In 2007, the county purchased the MCC for $2 million, when it was planned to be used as a back-up dispatch center. Since then, the county built a back-up dispatch center, and the MCC went unused. The agreement between Hamilton County and the City of Westfield states that Westfield will not purchase the vehicle, but instead staff it with personnel, provide storage and handle maintenance costs. Also, the city is required to deliver the MCC to any requested need outside of Westfield Washington Township.